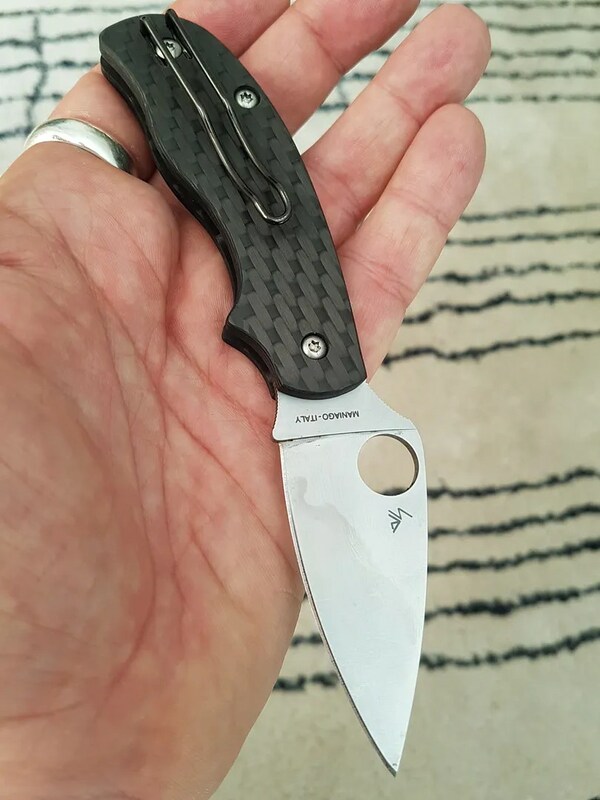 Spyderco C22 in ZDP189 — Amazing After Six Years Hunting in Tuscany ! This year, he has given it back to me after I had offered him my Native 5 in 110V which is IMHO an upgrade for Hare Hunting. The Backlock of a Native 5 is a perfect lock for that kind of use, but you can notice the Walker lock as not travel very far. The curved concave notch prevents it to go further. There is absolutly no play ! For the record skinning hares is not an easy task for an edge as the hairs and the skin are ruining the sharpness very fast. There is a lot of dirt which acts as abbrasive. I have made a video and soon will put it on line. 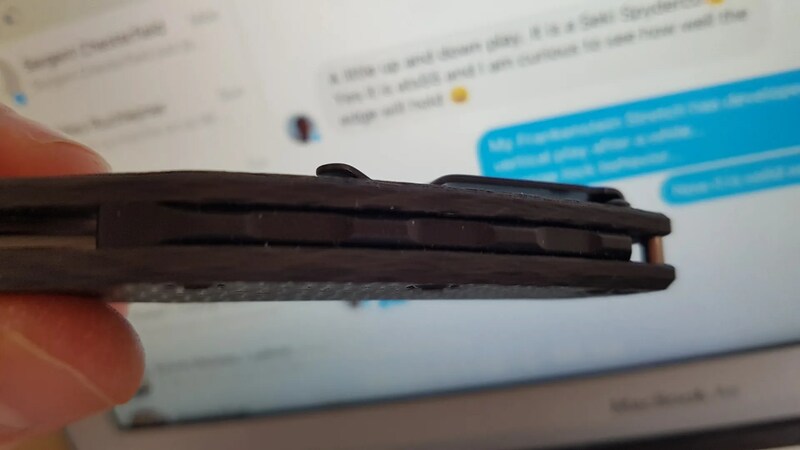 Being used everyday, Valter eventually broke the clip which is a very fragile part of the walker compared to spoon clips used noawadays in spyderco line. You can also see it was not clean everyday and used as an EDC in the countryside of his beloved national Park in the North of Florence in Italy. You notice the normal wear on the handle but Carbon fibers is incredibly sturdy as an slob material. It can be easily cure with some 1000 sandpaper work. There were also no pitting on the blade or on the liner lock. ZDP189 is known for pitting strangely with its 3% of carbon and 20% of chromium. But here anyway, no issues. I have started to clean the marks on the blade with some sandpaper. Then I have restored the edge to razor. No marks on the handle. 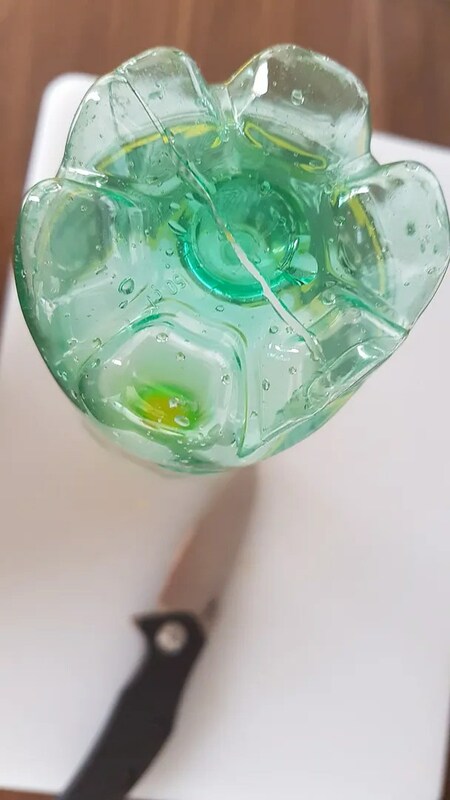 Valter used his knife with no afterthoughts. I know it was not used on wood but mainly as a skinning tool. It has processed hares but also been used on boars and deers. Also it was used on plastic and everyday mondane tasks as Walter is breeding hunting dogs. That’s not bad for a little gentleman knife which is a true workhorse. Posted on 05/10/2017 14/10/2017 Author nemosandmanCategories Folders, Photos, UncategorizedTags Carbon Fiber, EDC, Gentleman Farmer, Hard used, Hunting, Hunting Knife, Liner lock, Michael Walker, report, Seki CIty, Sharpening, Sheeple Friendly, Spyderco, Spydercoknives, Tuscany, Valter Nencetti, ZDP1895 Comments on Spyderco C22 in ZDP189 — Amazing After Six Years Hunting in Tuscany ! “Number 17” has entered in my life yesterday as I was angry about an order blocked in the airport for 12 days. I had ordered a Yojimbo 2 (G10, S30V) and since the 5th of May it has disappeared from the tracking. So yesterday I indulged myself with a very rare exclusive run for Knifeworks three years ago: a Yo2 with S90V and Carbon Fibers handle. Better, I had ordered a deep carry clip and it’s now mounted. My idea is to use the Yojimbo, not as a SD tool but as EDC tool. So this safe queen is going to see some mileage and S90V will be welcome for it’s very high abrasion resistance. This is my point, I hope the Yo2 will keep its own (point) sharp and solid. Some intense sharpening was mandatory. 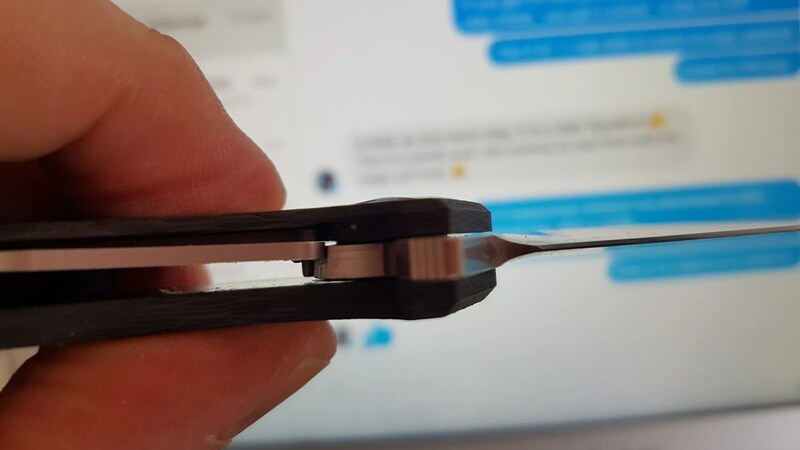 The edge was uneven from one side to the other (3mm against 2mm)… Now it’s much better after some intense passes on the Fallkniven little diamond/black stone tool and the Spyderco ceramic grey/white. And well, it works just fine. “…With regard to the utilitarian function of the Yo2–absolutely. I grew up in pretty humble surroundings. Although we didn’t have much, my Dad was very smart and skilled with his hands. I learned that the best way to have stuff was to make it, so I used to spend hours making toys out of cardboard, scrap wood, string, and anything else I could scrounge. One of my most prized possessions back then was an X-Acto knife set my Dad bought me with all the different blade shapes. Initially, I thought the different blades were cool and spent time swapping blades to cut different materials and shapes. After a while, though, I realized that the standard straight cutting edge was the most versatile. If I needed precision, the tip did the job. At the same time, if I needed cutting power, the straight cutting edge transferred power all the way to the point. 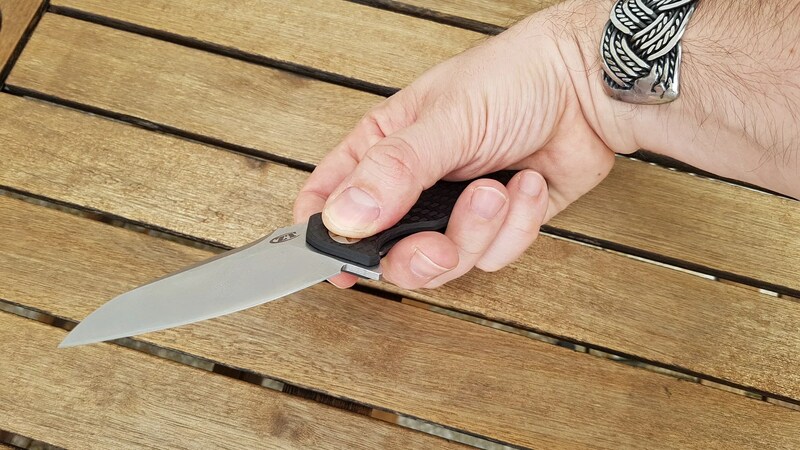 ” … Helping my Dad with DIY projects around the house, I noticed that most utility knives, electrician’s knives, and similar “trade-oriented” cutting tools were Wharncliffe or sheepfoot blades. Again, in practice, it made sense and they worked. I chose my first pocketknives–Case slipjoints with straight edges–based on that experience. When I started studying combative knife skills as a teenager, I read all the classic WW2 books on the topic, many of which recommended Bowie-style blades with significant “belly” to the edge so they could be used to snap cut. My taste in knives changed as a result of that and I began carrying blades with more belly and well-centered points. My first commercial knife design–the Masters of Defense Tempest–even reflected that style. However, when I had a chance to design what ultimately became the Ronin, I went “back to the drawing board” and did a lot of live-blade cutting with everything in my collection. 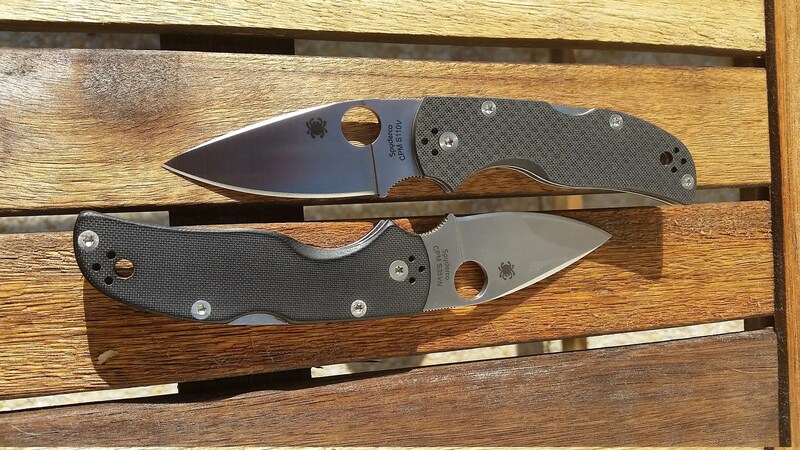 I found that the knife that cut best was actually my Spyderco C25 Centofante, which was a Wharncliffe. When I began to analyze and really understand the dynamics of cutting, I realized why. There is nice video made by Michael Janich explaining his design here on Youtube. 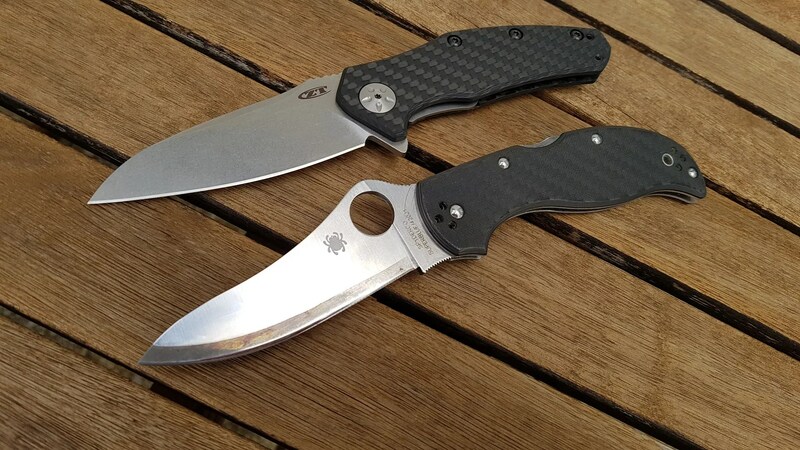 And by the way, the collector is just using a Yojimbo2 (S30V/G10) as an EDC. It got the scars to tell its story. Team Cuscadi new Carbon Fibers Scale on K390 Urban. After my Urban review I wanted a smoother experience. And give a more precious apparence. Carbon fiber is a really sturdy material and twenty years ago you could only find it in Formula One and jetfighters. The feel under the thimb is wonderful and the knife get clipped with ease. Great work from Team Cuscadi and great service. 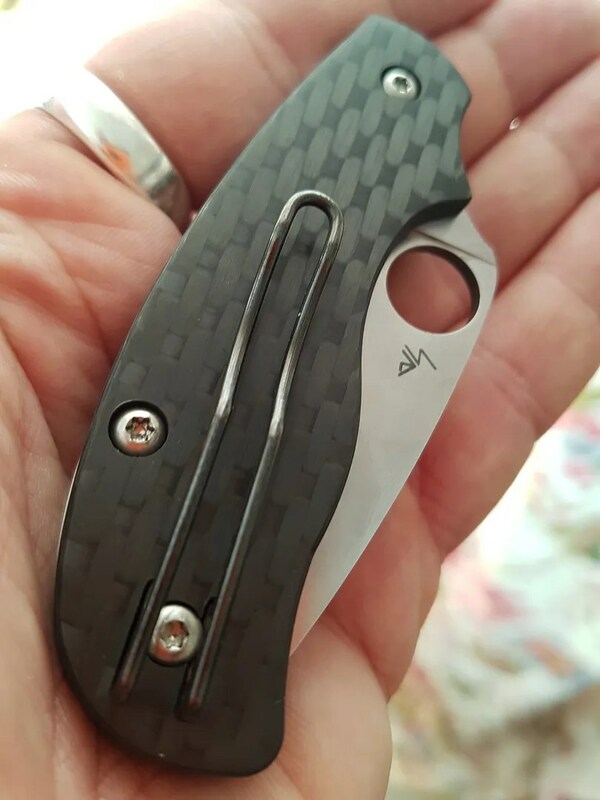 Posted on 16/03/2017 01/09/2017 Author nemosandmanCategories Folders, PhotosTags Carbon Fiber, carbon fibers, Clipit, customs, EDC, Legal, Sal Glesser, scales, Spyderco, team cuscadi, Urban4 Comments on Team Cuscadi new Carbon Fibers Scale on K390 Urban. 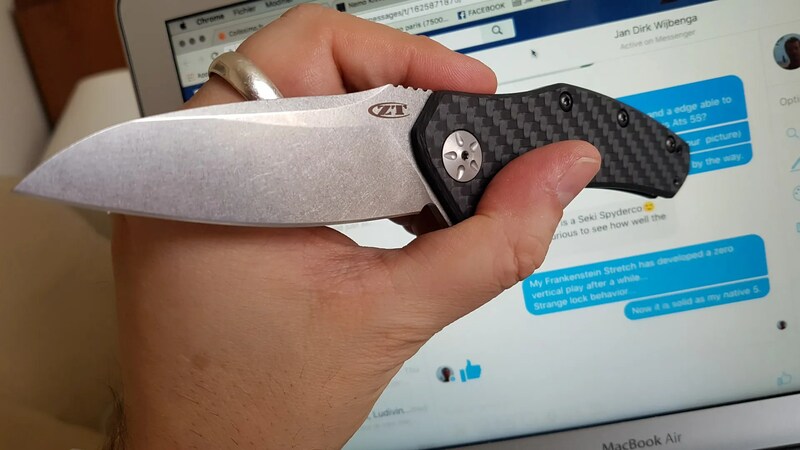 Zero Tolerance ZT0770CF – Fast and Furious. 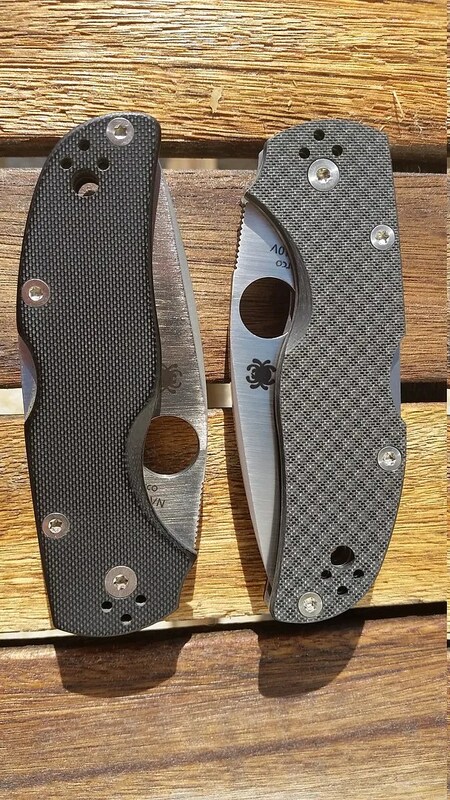 I love my Spyderco mantra 2. Great engineering, ergos and materials. An attention to details and a signature: Eric Glesser. He is a perfectionist and a clever one. But I do hate one thing: the trademark “little” hole. A place to catch grim and hard to clean on the field. Anyway, the Des Horn was a first step. A second step is the ST0770CF. I was in need of a “blind” folder. I mean a folder without any hole or thumbstub or disk. The Real Steal Megalodon was on my list: with its beautiful lines like a Sukhoi 27, M390 steel…. But then the Zero Tolerance caught my eye through all its great reviews. ZT knives were always synonym of heavy fat ground knives à la Strider. Not something I would enjoy as EDC. 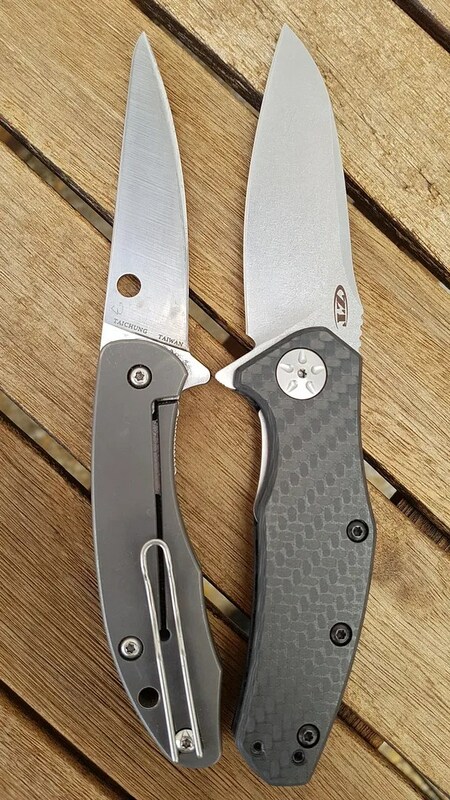 Unless I start to follow a special project around the ZT0770in M390 and especially a version in CPM M4 (ended with 69 dollars of international shipping fees). So I went to “La Coutelerie Tourangelle” famous for their good prices, great shipping fees (5.9 euros with tracking in France) and total absence of communication…. 😉 Just kidding, even if they are mute like a brick wall, they delivered a great service world wide. 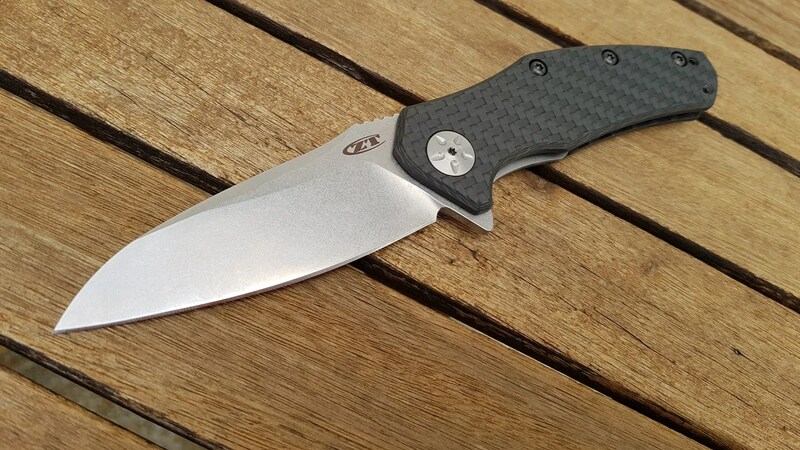 The ZT0770CF got no name. Its blade is beadblasted. This is a user not a safe queen. The assisted opening is strong and seems reliable. I have found some people were able to remove the spring easily and even order another bronze washer. But my idea was to have a spring making my flipping secure and complete. 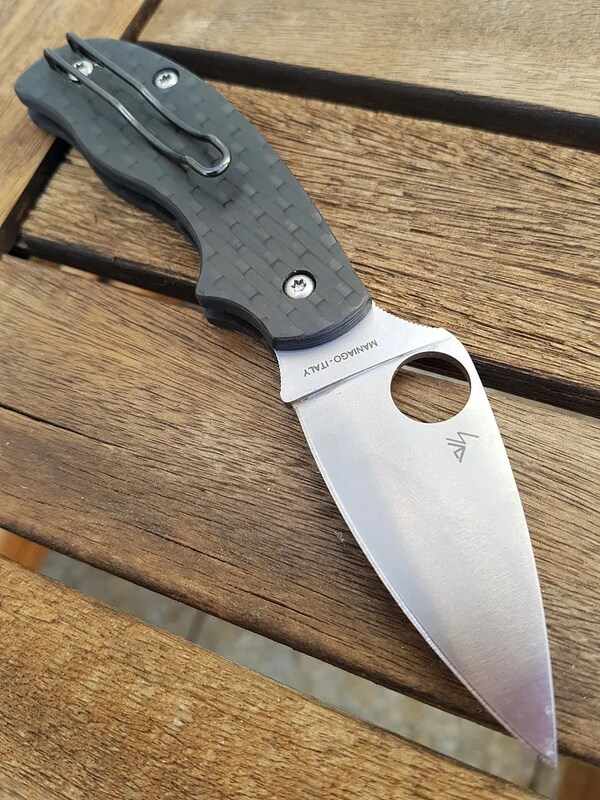 Many times my flipping was not 100% on my Southard on my Domino…. and it was frustrating. So no ball bearing on the ZT but a strong spring. Again if you don’t like it, you can remove it. It is positive and definitive. SCHLAKK !! It’s open. Now if you don’t want to be noticed you can open it against your leg, halfway and with a gentle flick it is open. 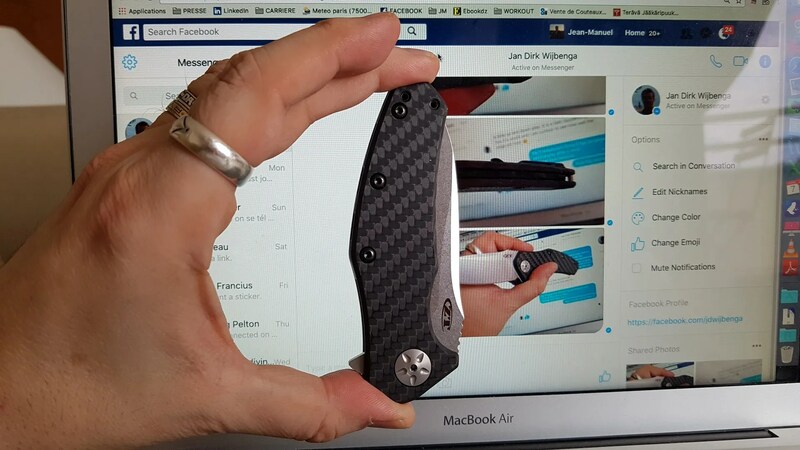 Balance wise, the ZT is perfect: the Carbon Fibers handle is so light. There is a black spacer, beautiful and very scifi. But the point of balance is just behind the pivot ! Perfect. 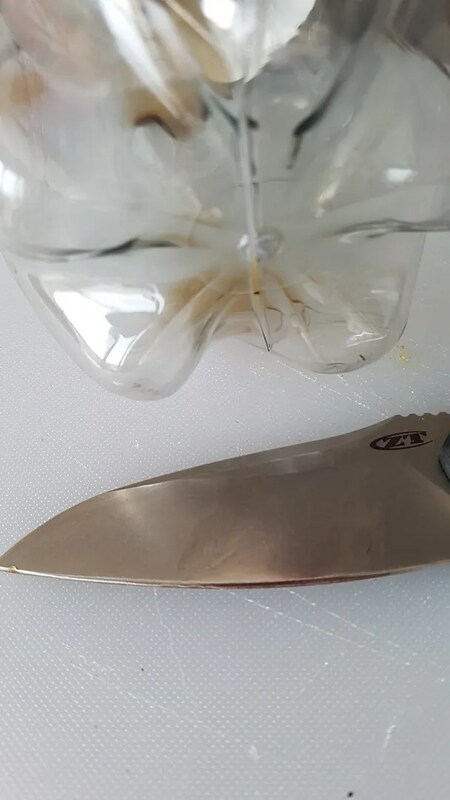 The knife is “alive” in your hands. The texture of the carbonfiber is smooth but matte. Just like my sanded G10 handles. There is enough blade to open the knife like a gentleman folder. It won’t jump from your hands, the spring is not “that” strong. There is a detent you can also feel at the end of the blade course. The action is smooth, enough smooth to have the gravity works fine when unlocked. This is a beautiful knife with a great attention to details. The liner lock is thick and nested. Easy to operate. The detent ball is visible. Everything is in place. The jimping on the blade is not to aggressive. The jimping on the flipper is more aggressive but do not come in contact with finger once open. The guard is very cleverly thought. 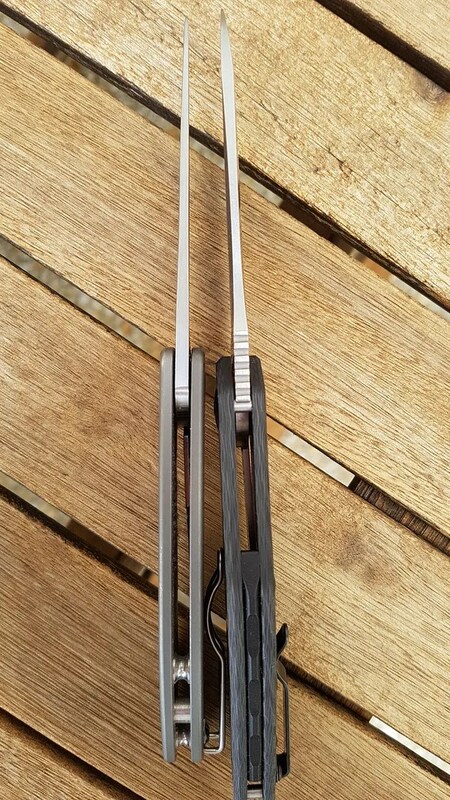 The position of the pin and the jimping on the flipper. It’s a clockwork ! 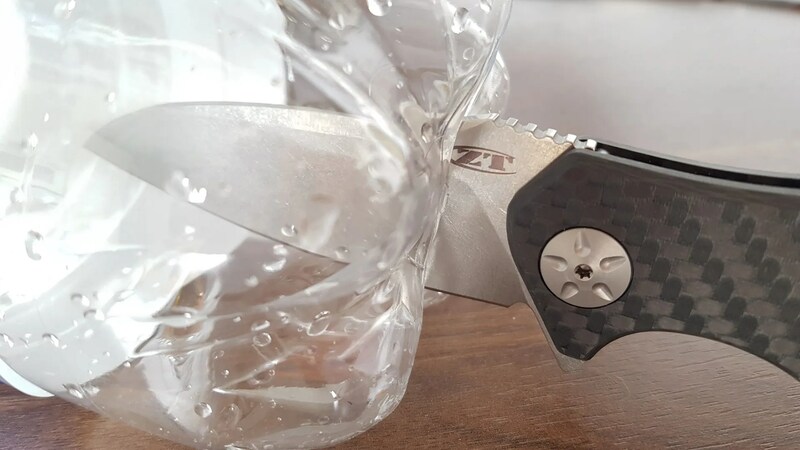 Closed or open, there is no hot spot on the ZT0770CF, all lines flush together: very impressive. The pivot screw is beautiful and despite its exotic look just need a torx to be unscrew. You can rest your thumb on it, it works like my Calypso’s screw guard. The CF handle is renforced by nested liners and despite being light the construction is very solid. Ergos are great. I mean they suit my four fingers. I already loved on my Mantra how the flipper served as guard once the blade open. 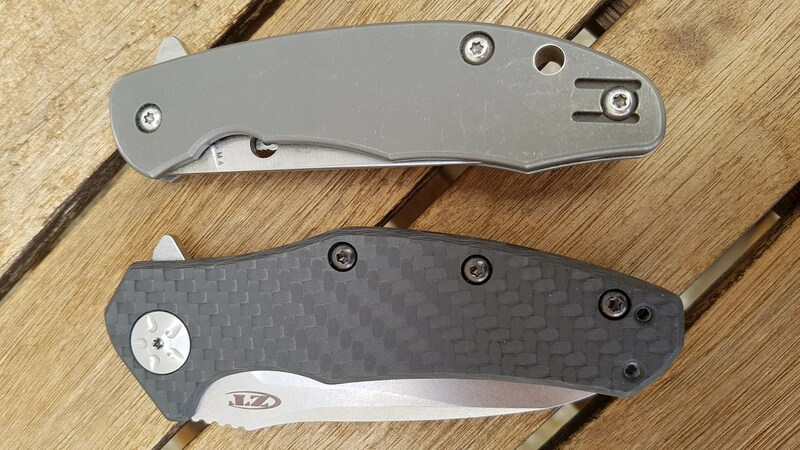 Here on the ZT the guard in integrated with flipper like on the Domino but more pronounced. I really love that configuration. 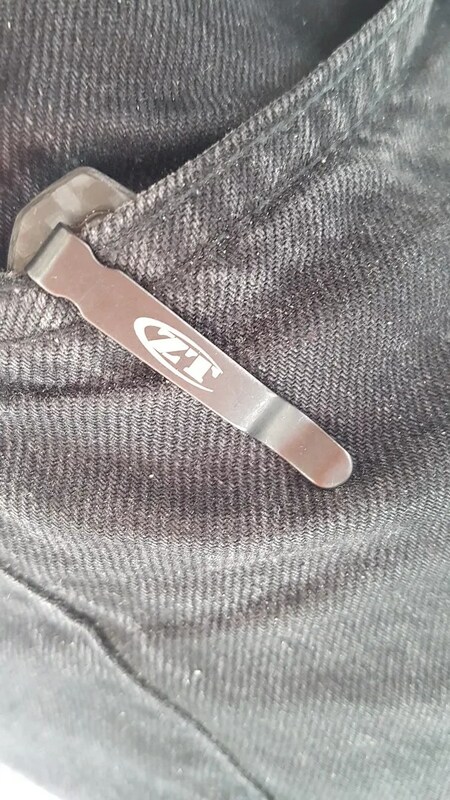 The ZT got a particular blade: high flat thinly ground with a kind of sheepfoot shape. It works. 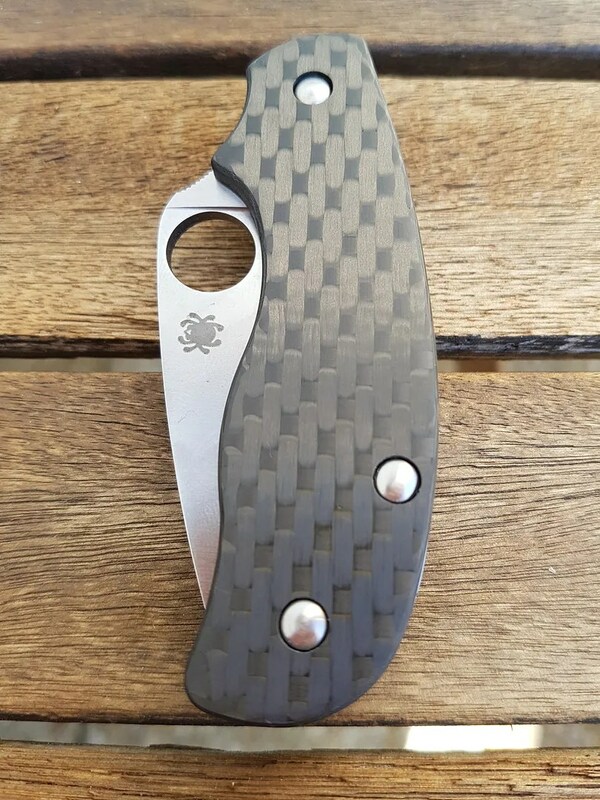 You got some belly near the pivot and a straight edge near the point, something between a Spyderco Positron a stretch Cricket. 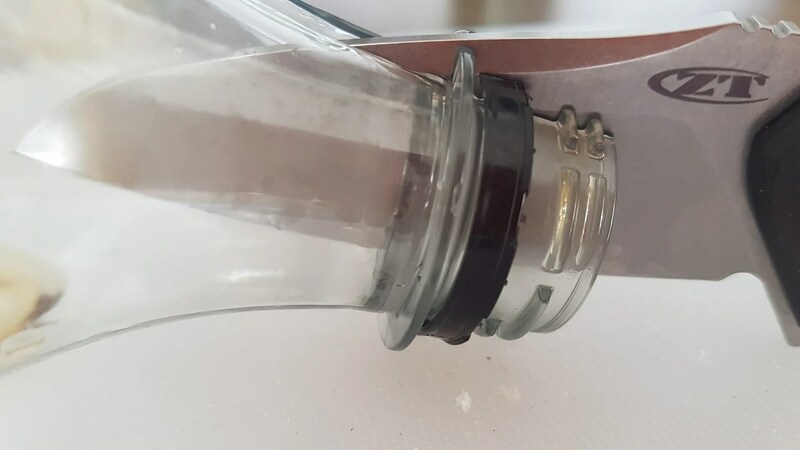 It cuts aggressively and pass my plastic bottle bottom with force and ease. Eventually I find the ZT’s blade is simply gorgeous, all in curves… The belly near the pivot will give a lot of power for pushcuts into wood. I love Elmax since my Lionspy. I remember beating the crap out of it and it was really forgiving: no chipping and great sharpness. Also I’m in love with a Squeak in Elmax with titanium handles for a year now and this pure little Italian wonder will be review soon. 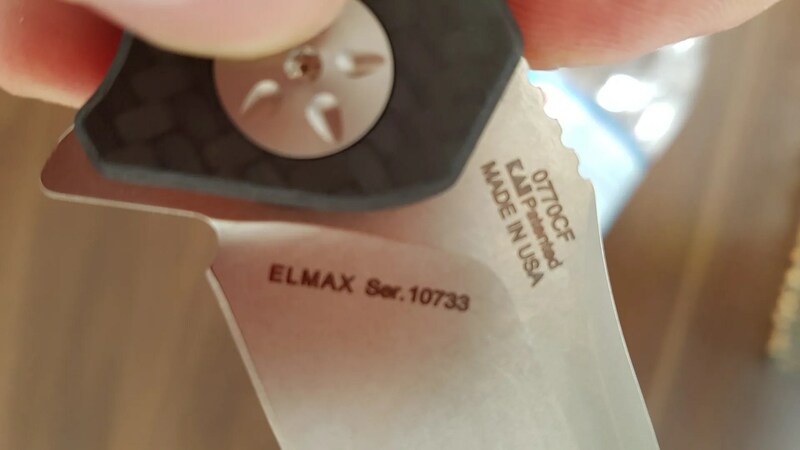 Elmax is such a great knife steel. No chipping, edge stability, ease of maintaining. What not to love ? 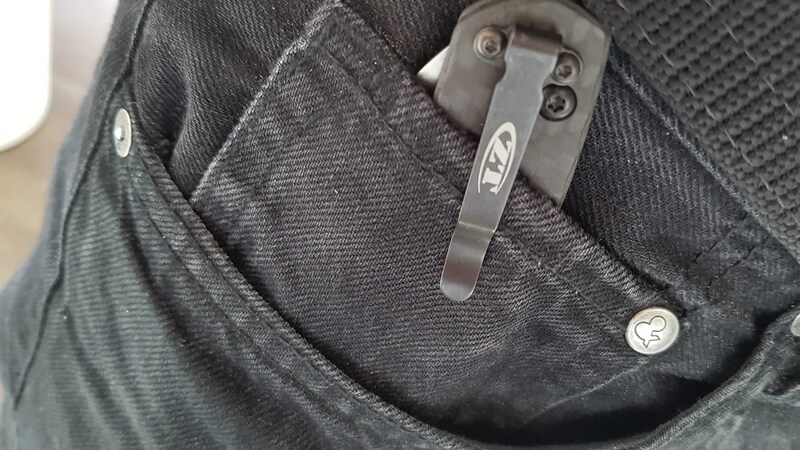 The black clip is short but made for deep carry. This is a very low profil configuration which leave almost zero print. 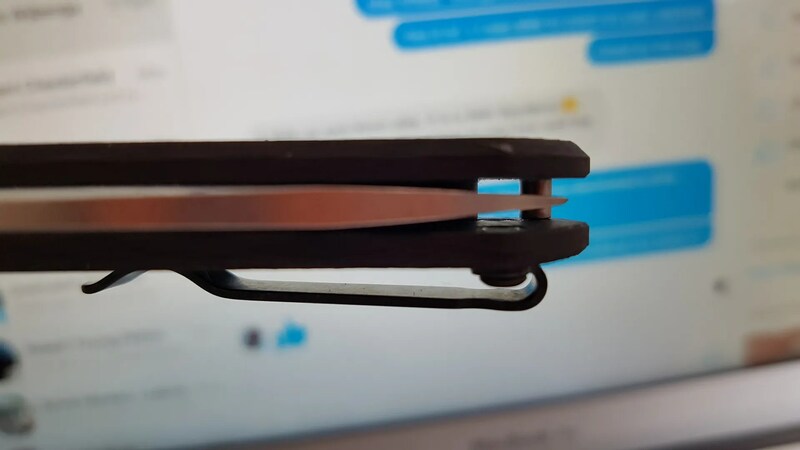 The knife can find a nest into the watch pocket too. We got here a very compact package and very light: a true EDC. Some more test once the edge is “de-shouldered”. Posted on 07/02/2017 11/02/2017 Author nemosandmanCategories FoldersTags Carbon Fiber, CPM M4 High Speed Steel, EDC, Elmax, Eric Glesser, Flipper, Knives, Mantra 2, Nemo, Peter Kershaw, Review, Spyderco, Zero Tolerance, ZT, ZT07703 Comments on Zero Tolerance ZT0770CF – Fast and Furious. Exactly three years ago, on 1st october 2011, I had received my Native 5. You can still read how ecstatic I was toward that great ocket knife: solid, ergonomic, easy to carry in the pocket watch. I was especially amazed by the strong lock back with zero blade play and the new easy to polish on leather S35V steel. Three years later, the Native 5 is getting a spectacular emotionnaly overloading Sprint Run: CPM110V blade and Carbon fiber handles. 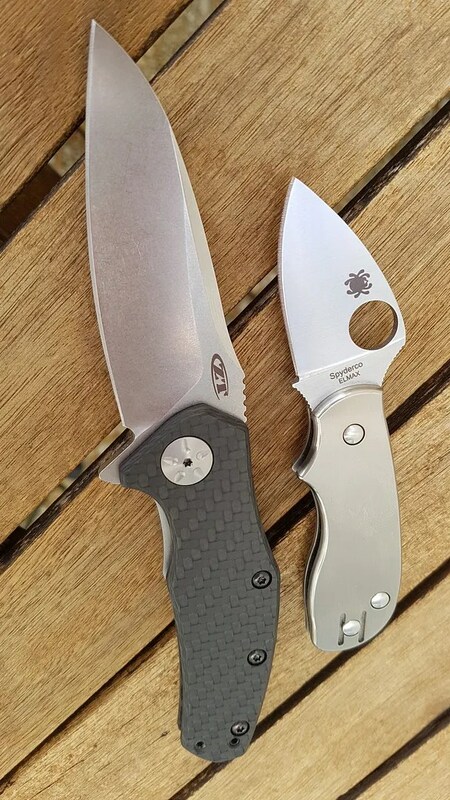 In 2012 (or 13) the Spyderco Forum knives was also a CPM110V Native but with a green diamond G10 handle. 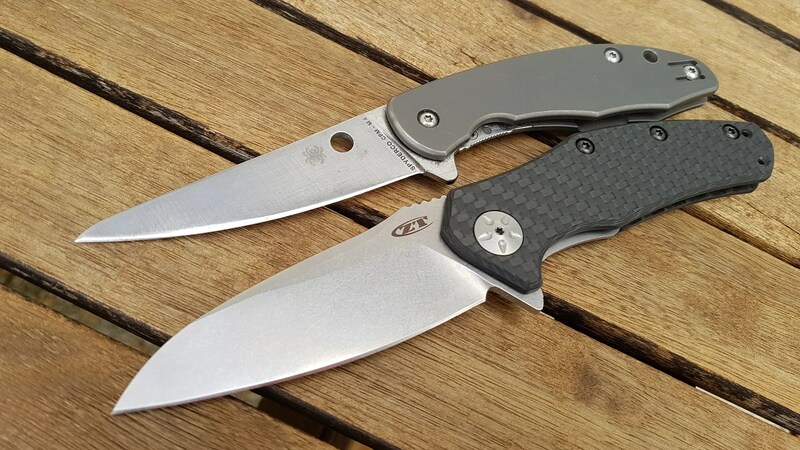 This time some grammes are outed as Carbon Fiber is lighter than G10. Mine is as flawless as my first Native. The blade action is smooth as ever and I can generate any play vertical or horizontal. The grind is a little thicker compared to my S35V version but not a big deal as the knife came as a razor. Again I have installed a Delica 4 blacked clip for low profile, as I carry the knife tip up in my pocket watch. CPM110V is a great steel that I was not able to really dull yet on my Dark Blue Manix 2. That steel seems to be fresh up easily with a dozen of pass on a white ceramic. I’m very happy to continue the testing on one of my favorite plateforme: the Native 5 ! 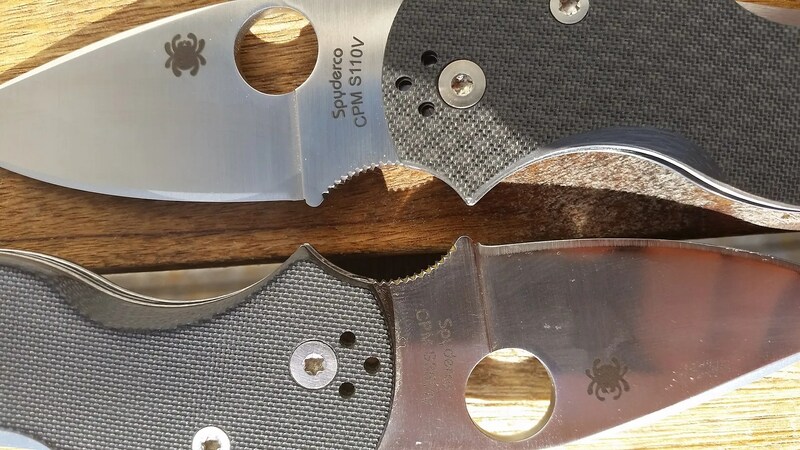 Again Spyderco is a figure of pionneer giving the chance to use the best high tech metallurgy on their best refined design. More soon…. So stay tuned. 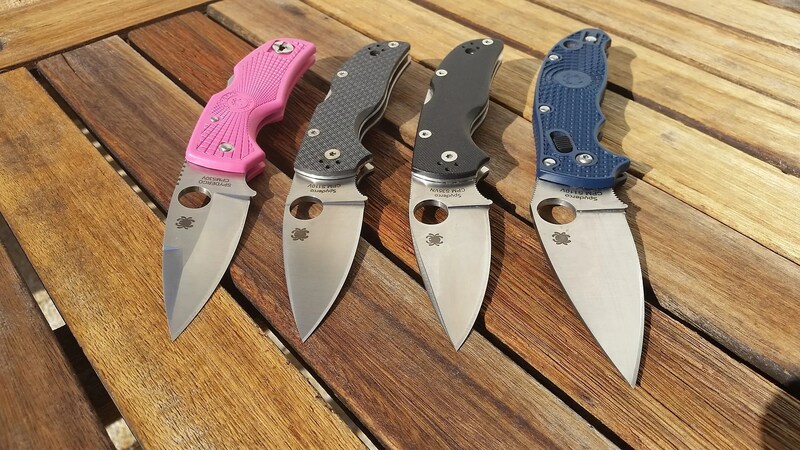 The Pink, the Sprint Run, The S35V and the Dark Blue Manix 2. The Carbon fiber is on the right.